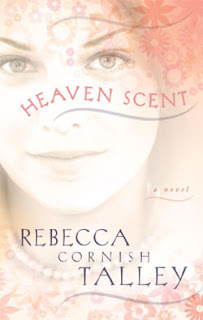 Heaven Scent is a young adult novel written by my friend, Rebecca Talley. I met Rebecca at the LDStorymakers Writing Conference in March. I am very impressed with Rebecca because she has ten children. For me, writing is tough with my three boys. First of all, I love the cover of the book. It's beautiful and invites you to open it up. The novel begins with Liza's disappointment that her father does not attend her very important high school basketball game. This disappointment is quickly followed by others as her father continues to pull away from the family to devote time to his career. She hopes to gain a coveted spot on a local university's basketball team, and she does not feel her father's support. Family life continues to deteriorate for Liza as her father spends too much time at work and her mother stops finding excuses for him. Along with worries about her personal life and thoughts about the basketball scholarship, Liza now worries that her parents might be facing divorce. Along the way, she befriends a classmate, Kyle, who is a member of the Church of Jesus Christ of Latter-day Saints. He befriends her and wants to tell her about the church. This story depicts real young adult challenges as we watch Liza struggle with increasing difficulties in her life. Tragedy strikes, and I have to say even though it clearly states that on the back cover, I was surprised. I was not expecting it. The tragedy puts things into perspective for Liza and presents further challenges. She has to find room in her heart for forgiveness and possibly for acceptance of a religion that seems strange to her. I recommend this book for any young adult who is looking for a story to enrich their lives and give them much to think about. Ten children and still writing and publishing...wow, I'm impressed too! !